Swatches and Review: Pre-Fall ’14 Nailbox Trendbox Curated by Chalkboard Nails! Hello all! Sorry for the silence on the blog this week. Something came up that took over my life for a few days. But I'm back and hope to catch up in the coming week. Today I have the second Trendbox from Nailbox to share with you. Trendbox is a seasonal subscription box that includes high-end, full-sized polishes in the season's hottest colors...hand-selected by a top nail blogger or trendsetter. 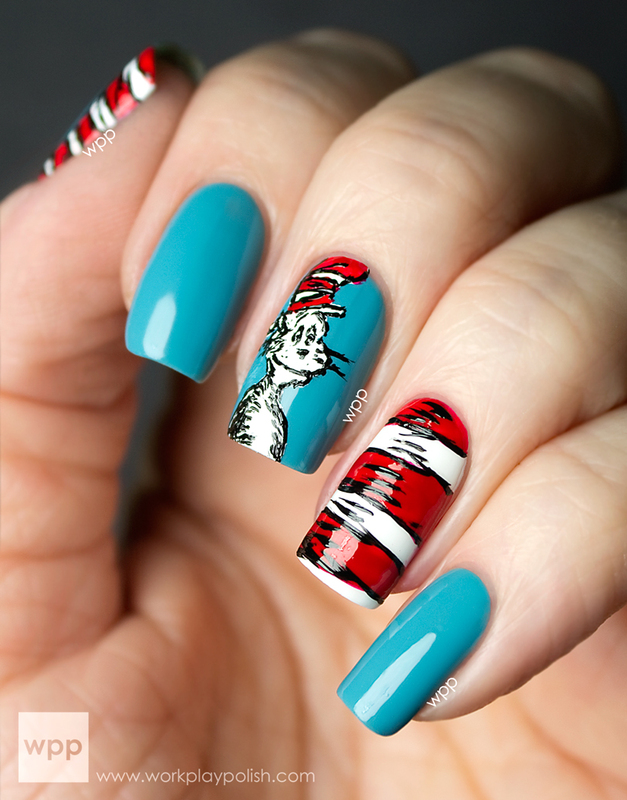 The latest box was curated by none other than the talented Sarah of Chalkboard Nails. I was so excited when she asked me to review it and even more excited when I opened up the box! Sarah chose four shades and a matte topcoat. And together, this set perfectly transitions you from Summer to Fall (L-R above): NCLA Santa Monica Shore Thing, LVX Cashmere, Orly Hot Tropics, Priti Chrysanthos, and Essie Matte About You. The box also includes a bonus item: a set of NCLA Aly En Vogue nail stickers. First up is Priti Chrysanthos. Gah. I squealed when I opened the box. I LOVE this gold. If you look closely, you can see there's a hint of silver foil mixed in. It makes the polish not too yellow (which I prefer). This is my very first Priti and the formula and application were excellent. Orly Hot Tropics is the bright polish of the bunch. It's a true fuchsia with a beautiful, dense golden shimmer - a great combination. I used three coats for full coverage. LVX Cashmere is a slightly rosy taupe creme. So pretty! 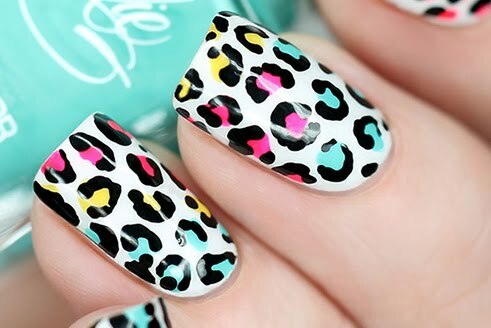 I'll be wearing it to the office often and it will be great as a base for nail art. Sometimes these near-white neutrals can go on streaky, but Cashmere was smooth and full-coverage in two easy coats. NCLA Santa Monica Shore Thing is a soft turquoise creme that's a little dusty. I'm a huge fan of NCLA. The formula was really smooth and the color is perfect for these final days of Summer. And finally, Essie Matte About You can really transform any of the polishes in the box, but I wanted to see what it would do to blingy Chrysanthos. It "traps" in the sparkle and softens the look. This is a great matte topcoat. Each TrendBox contains at least 4 full-size nail products with a retail value of over $60. You can purchase boxes individually for $35 or an annual subscription for $126 (for a 10% savings). The boxes are available online throughout the season so if you’re risk-averse (like me…LOL), you can wait until the box is released to see the polishes before you purchase. Either way, it’s a great deal. So what do you think? Sarah did an amazing job. I'm totally impressed with the value for the money. I reviewed the first box by Michelle of All Lacquered Up (see review here) and it was awesome, as well. I encourage you to check out Trendbox. I wonder who's curating the next box?! 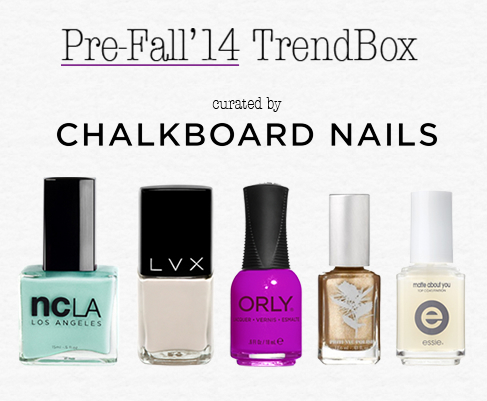 The Nailbox Pre-Fall’14 TrendBox curated by Chalkboard Nails is available now at Nailbox.co for $35 with no additional commitment. Or buy a year subscription for $126. Nailbox also sells the latest polishes and gift sets from premium brands with a 14-day return policy and free shipping for purchases over $45.